A Choice of 8 Beautiful Candles with Scripture: Believe (Warm Home) Encourage (Juicy Peach), Forgive (Vanilla Bean), Hope (Baked Apple Pie), Love (Cinnamon Apple), Praise (Garden Rain), Serve (Cedar & Spice), and Trust (Gardenia). Each candle burns up to 75 hours. Easily raise money for mission trips and other church related activities. Our Journey of Faith Inspirational Candles include beautiful scripture on the packaging. 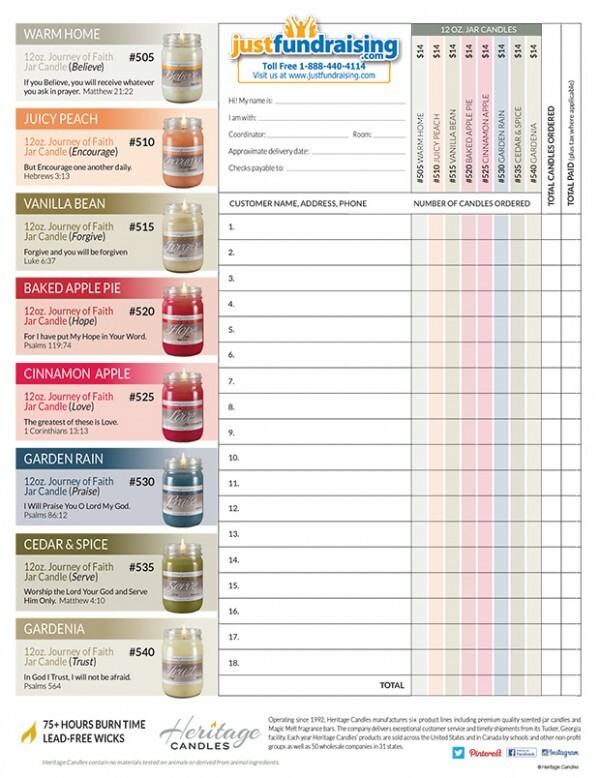 They are made from the highest quality blended waxes and fragrances available, and hand poured right here in the USA! Each 12 oz canning jar comes gift-boxed for easy gift-giving and is decorated with a label featuring a scriptural verse. 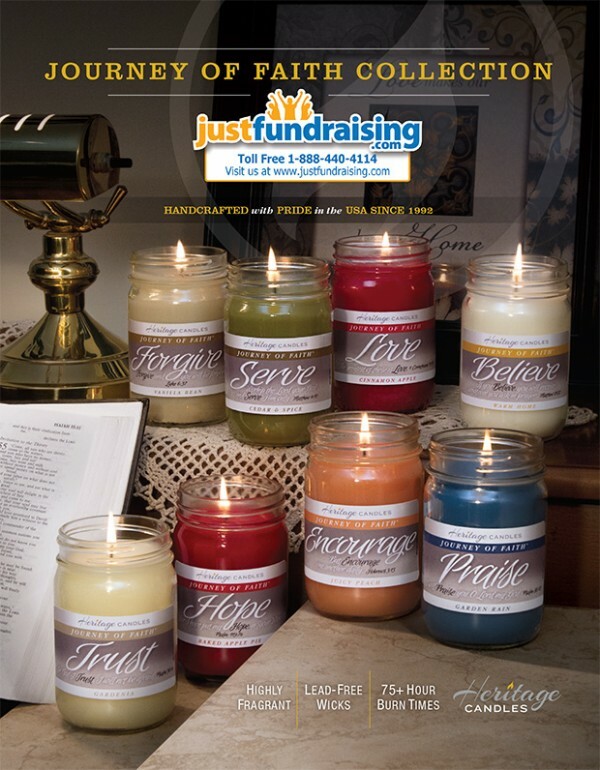 The premium quality of these candles combined with the inspirational verses make this the perfect fundraiser for your group. FREE to Start: The Journey of Faith Inspirational Candles fundraising program costs absolutely nothing to get started. Simply let us know how many fundraising participants you have and we’ll send 1 order-taker for each of them, at no charge. Priced To Sell: At only $14 each, these candles are very affordable, making a perfect gift to yourself, a family member or a friend. How Does the Journey of Faith Fundraiser Work? 1. Order 1 Journey of Faith order-taker PER fundraising participant – they’re FREE of charge! This fundraiser was great. Our church group was raising money to attend camp this Summer and we raised over $2,000 profit! We had 2 group members that sold over 40 candles each. Our 8th graders were raising money for a confirmation retreat. We worked together with 3 other parishes and raised over $2,500 profit! We had 3 sellers that sold over $300 on their own. We're very happy with the results. The youth group at our church raised over $1,000 profit in a little over 2 weeks! We sold these same candles last year and everyone loved them, so everyone was eager to purchase more this time. Our church youth department raised over $1,000 profit with only 15 sellers! The Heritage “Journey in Faith” Candle Collection was a big hit! Looking forward to placing an additional order. Our school has been selling candles for the past 2 years and we seem to be raising more each year! We raised over $3,300 for various campus upgrades. Our church raised over $900 profit for our building fund in a little over 2 weeks! We will definitely be using this fundraiser again. This is the 2nd year we sold your candles and again the results were beyond our expectations. We made just under $1000 profit. Our Journey of Faith candle fundraiser went very well. We made a profit of $1,400, and we are looking forward to working with you again. Thanks to the generosity of our community and surrounding communities, with only 18 sellers, we sold over 500 candles. We're very happy with the $2996 profit that was generated for our church building fund. We have a baton group that needed to raise money for uniforms. Although we only had 16 sellers participate, we ended up raising over $1,300! 3rd year doing the candle fundraiser, and it is wonderful every time we do it. They basically sell themselves. We did the Journey of Faith candle fundraiser and they sold a total of 221 candles. This money will help them pay for their hotel, food and travel to compete in their State and International competitions. They're a great group of kids with lots of ambition for many more fundraisers with your company. We're going to do one fundraiser a month until June of 2013!! This is one of the ways that we raise funds to help support Suicide Awareness/ Support ! Great outcome this year! Our group is raising funds to compete in our Church National Coutesy Welfare, to help those in need. We just started our fundraiser and have sold 10 candles in just a of couple of HOURS! we are excited to see how much more we can sell and raise for our camp. We love Just Fundraising for helping us reach our goals! We have a small church and we needed to raise money for property taxes, We only had a group of 8 people helping with the selling but we did very well. We had sold the candles before and really liked them, they are great for our target audience since they can give them out as gifts. TJ. This was by far the easiest and most convenient fundraiser! Just Fundraising staff were awesome. The Journey Of Faith candles all smelled wonderful. All of the people that ordered were very satisfied! Fast delivery also!! Our Strike Force is using funds to participate in Scholarship Tournaments.